Join us for a 20th anniversary screening of Steven Spielberg's AMISTAD, with a cast that includes Morgan Freeman, Anthony Hopkins, Djimon Hounsou, Matthew McConaughey, Nigel Hawthorne, Chiwetel Ejiofor, Pete Postlethwaite, Stellan Skarsgård, and Anna Paquin. 2:00pm Sunday, December 10, in the Whitney Humanities Center, 53 Wall Street in New Haven. "Treasures from the Yale Film Archive" screenings are always free and open to everyone. Learn more. The following post was written by Camila Tessler, Archivist, Manuscripts and Archives. 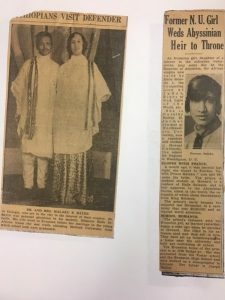 Clippings relating to Dorothy Hadley’s marriage Malaku Bayen, circa 1931. Dorothy Hadley Bayen Papers (MS 1570), Box 1, Folder 3. Dorothy’s work was not just of a housewife and a mother, but also as an activist for the Ethiopian and black communities, both abroad and locally. During various times in her life she acted as a fundraiser for the Haile Selassie Fund, working in New York to raise money both from the black and white community. 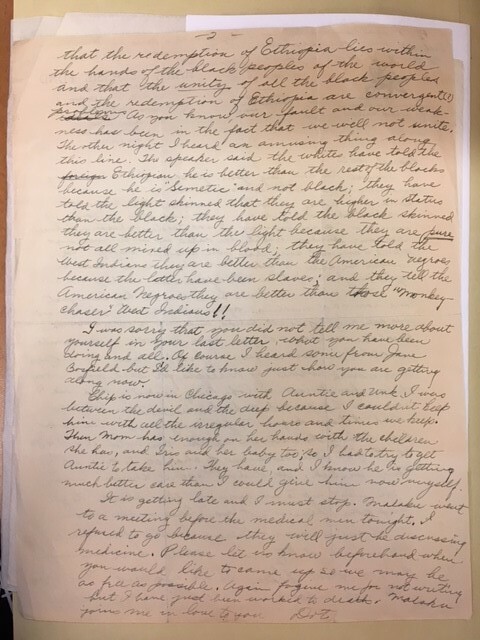 In one letter, she stated that she could easily raise funds in the black community, while the white community was never very generous, leading her to conclude that the natural home for black Americans would be Africa, and that Ethiopia held the future of the unity and the redemption of black people. Letter from Dorothy Hadley Bayen to her sister, Leora Hadley, page 2, undated but circa 1935. Dorothy Hadley Bayen Papers (MS 1570), Box 1, Folder 1. Dino Robinson has written an article about Bayen, summarizing her work for the Ethiopian community and the movement that became the Rastifarian religion here. 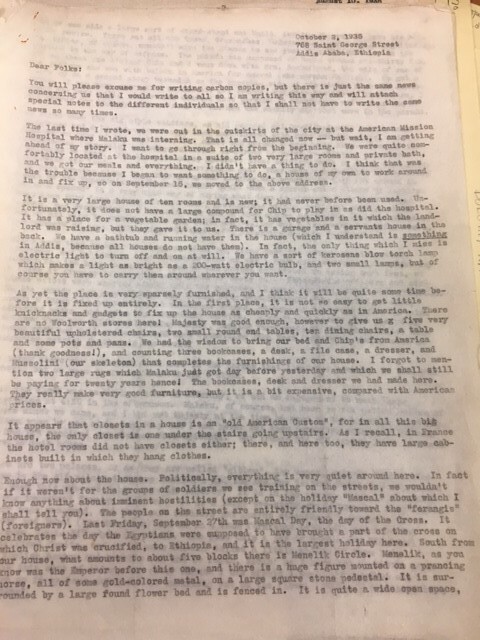 The Dorothy Hadley Bayen Papers at Manuscripts and Archives do cover this facet of her life, but they also demonstrate some of the culture shock and cover the adaptation of a woman who grew up in the Midwest to a life in Ethiopia. 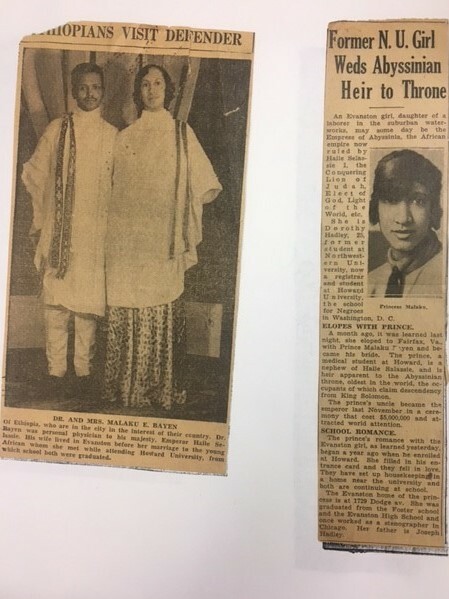 In several letters, she chronicles everything from the purchase of furniture (expensive in Ethiopia, but of good quality) and the personalities of her servants (from good to bad to drunkards) to life as a newly minted member of what was the oldest royal dynasty on the planet. Letter from Dorothy Hadley Bayen to her family, page 1, 2 October 1935. Dorothy Hadley Bayen Papers (MS 1570), Box 1, Folder 1. 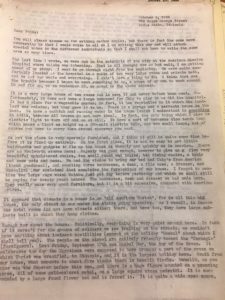 Through her correspondence with her family in the Evanston, we get a good picture of a person in an extraordinary situation, and a witness to the beginnings of a movement that formed the basis of a new religion. But we also are given the perspective of an outsider to a new culture, a new life, and a new way of thinking. 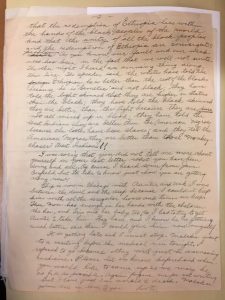 See the online finding aid for the Dorothy Hadley Bayen Papers in Manuscripts and Archives for additional information about this collection. We invite everyone to donate non-perishable food items and personal care items to benefit IRIS (Integrated Refugee & Immigrant Services), a New Haven-based agency that helps resettle refugees to CT and provide lifesaving support to assist in their transition to life in the United States. Your donations will go toward stocking both the apartments of resettled refugees and the IRIS food pantry. We CANNOT accept any food products containing meat or pork. We will also be hosting a Virtual Drive to benefit the Connecticut Food Bank! Access online giving here. A few clicks will let you quickly and easily donate “food” and funds. Please give during this festive time of year! If you have any comments or questions, please feel free to email sarah.davis@yale.edu. Please join us for the Arts & Humanities Book Talk Series on Artisanal Enlightenment: Science and the Mechanical Arts in Old Regime France by Paola Bertucci, Associate Professor of History. The talk will be held on November 30, at SML in the International Room. Refreshments will be served at 4:00 pm and the talk will begin at 4:30 till 6 pm. What would the Enlightenment look like from the perspective of artistes, the learned artisans with esprit, who presented themselves in contrast to philosophers, savants, and routine-bound craftsmen? Making a radical change of historical protagonists, Paola Bertucci places the mechanical arts and the world of making at the heart of the Enlightenment. At a time of great colonial, commercial, and imperial concerns, artistes planned encyclopedic projects and sought an official role in the administration of the French state. The Société des Arts, which they envisioned as a state institution that would foster France’s colonial and economic expansion, was the most ambitious expression of their collective aspirations. Artisanal Enlightenment provides the first in-depth study of the Société, and demonstrates its legacy in scientific programs, academies, and the making of Diderot and D’Alembert’s Encyclopédie. Through insightful analysis of textual, visual, and material sources, Bertucci provides a groundbreaking perspective on the politics of writing on the mechanical arts and the development of key Enlightenment concepts such as improvement, utility, and progress. Explore mapping innovations with the Connecticut and Yale GIS communities. This day-long celebration–part of international GIS Day, which showcases applications of geographic information systems (GIS) technology worldwide–includes panel discussions, presentations, workshops, networking opportunities, and a GIS Day Cake Reception. The event is open to the entire community. For the full schedule, please visit the official page. To register, please visit the Eventbrite page. There will be a digital poster session on display throughout the day as well as a digital Story Map contest. Submit your map and you may win an Amazon gift card! Deadline to submit: 11:59pm, November 12. Submit a proposal for a 3-minute Lightning Talk on an Earth Engine Project. The talks will be presented during a breakout session at CT GIS Day. You may choose to introduce a spatial analysis project that uses Earth Engine or delve more deeply into a geospatial aspect of the work. Deadline to submit: 11:59pm, November 12. Join us at CSSSI on November 16, at 3 - 4:30 pm, for Professor Shiller’s talk about Financial Markets in Theory and Reality. There will also be an opening reception for the new media wall exhibit titled "Economics Department at Yale: Understanding and Changing the World." How do speculation, manipulation, and deception shape the economy and economic behavior? Robert Shiller, winner of the Nobel Prize in Economics (2013) and Sterling Professor of Economics at Yale, will explain his theory of speculative bubbles as illustrated in his best-selling book Irrational Exuberance. He will provide examples from speculative price movements in the United States and discuss the effects that manipulation and deception have on confidence in the economy. Shiller will also discuss narratives and their epidemic spread in relation to recent real estate prices. On November 15, from 8:30 a.m. to 6 p.m, explore mapping innovations with the Connecticut and Yale GIS communities! This day-long celebration–part of international GIS Day, which showcases applications of geographic information systems (GIS) technology worldwide–includes panel discussions, presentations, workshops, networking opportunities, and a GIS Day Cake Reception. Events include a keynote by Jennifer Marlon (Yale Program on Climate Change), a presentation on crisis mapping in Somalia by representatives of Abaaraha, a variety of workshops and breakout sessions that bring together research and practice, and a “mappy hour” at Mory’s. The complete schedule is available at http://csssi.yale.edu/gisday2017. CT GIS Day at Yale is organized by Yale University Library, Yale School of Forestry and Environmental Studies, and the Connecticut GIS Network.